A great dish for your 4 Day Diet and yummy, too. The recipe is basically the same posted for “Soup with lima beans“, only with less liquid. My daughter loves it, my husband likes it and my son will eat it, so we’re good on the family front. How to make: Soak the beans overnight in a bowl of water. Strain and boil in a pot for about half 45 minutes to an hour or until crunchy soft. Strain the beans. In a deep pan, saute the onion for about five minutes. Add carrots and celery and saute for another 5 minutes. Add the tomato sauce and some water that you used to rinse the tomato can. Have enough liquid to barely cover the beans. Add salt, pepper and optionally red crushed pepper flakes. Bring to boil and add the beans. 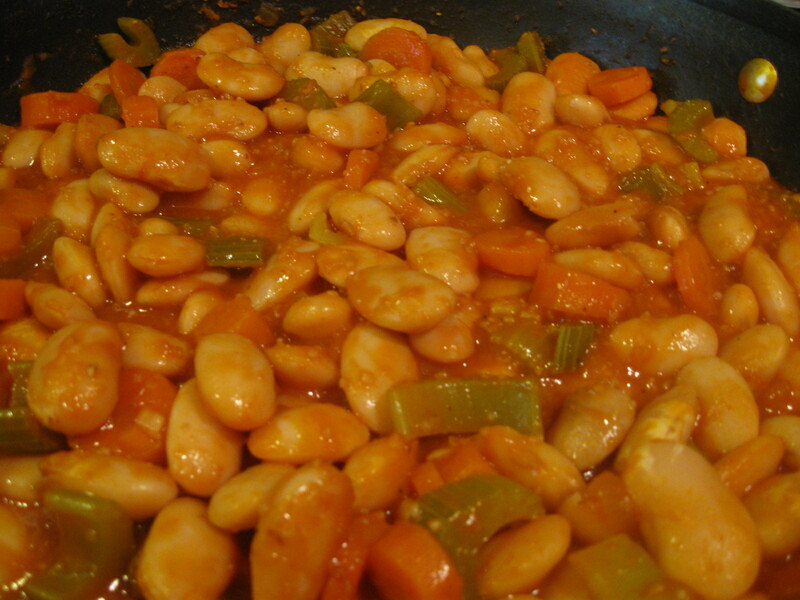 Cook at low heat for another 45 minutes or until the beans are soft. Check for water to be sure your beans are not burning and add more if you need to cook longer. The ‘grains’ you see in my photo are whole grains cereal that I added at the end for extra fiber. I LOVED the lima beans!!!!!!!!!!!!! Thank you, Melina 🙂 You are the best and you have great taste!